The remains of the Hamangia culture - from the middle Neolithic period - were found mainly in Dobrogea (Dobruja) and in the neighboring regions. Hamangia - today Baia, near the town of Babadag, in Tulcea county - was the name of the village in which the first traces of this New Stone Age culture were discovered. The two clay figurines - The Thinker and The Sitting Woman, unearthed in 1956 in a necropolis from Cernavodă (a town in Constanţa county), are today considered masterpieces of the Neolithic art. The Thinker represents a man sitting thoughtfully on a stool. The statuette became a symbol of the creative force of the human thought. 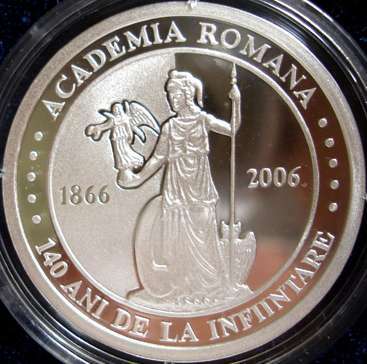 The Literary Romanian Society, founded on April 1st/13th 1866 by a decree of the Princely Lieutenancy, was transformed in August 1867 into the Academic Romanian Society and had the following goals: settling the orthography, elaborating a grammar and a dictionary of the Romanian. 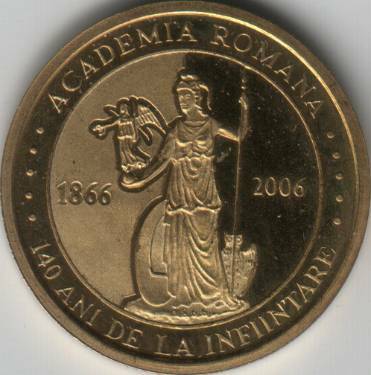 The law from March 1879 transformed this society in the Romanian Academy, a national institute having three sections: the literary section (literature, art, philology and philosophy), the historical (history, geography and social sciences) and the scientific section (theoretical and applied sciences). 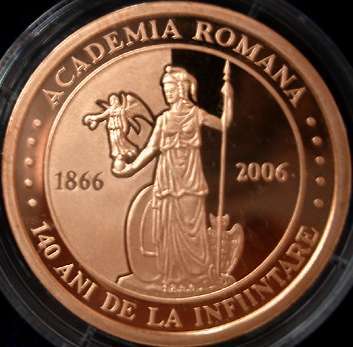 Before 1989 the Academy also bore the following names: Academy of the Romanian People's Republic and Academy of the Socialist Republic of Romania. Goddess Minerva (Athena for Greeks) was one of the Capitoline Triad gods (beside Jupiter and Juno). She was the goddess of wisdom, of all crafts, of war skills, and also protectress of science. Minerva taught mankind architecture, sculpture and painting, pottery, weaving and embroiding. The ensigns of the goddess were the owl (symbol of wisdom) and the snake (standing for prudence). The golden aegis, the plate armor and the lance are attributes of Minerva. On the aegis Minerva bores the head of Medusa, with snakes instead of hair, the Gorgon killed by Perseus. The one who looked at Medusa's head was instantaneously turned to stone, so the goddess enemies had no chance to defeat her. 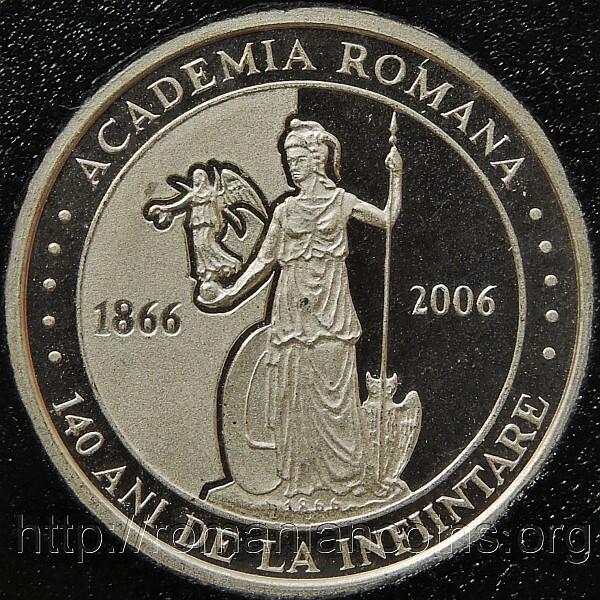 Fortunately, on the Academy emblem the aegis is placed with the petrifying face on the other side. In the left hand of Minerva lies a winged Victory. Below the lance is an owl. 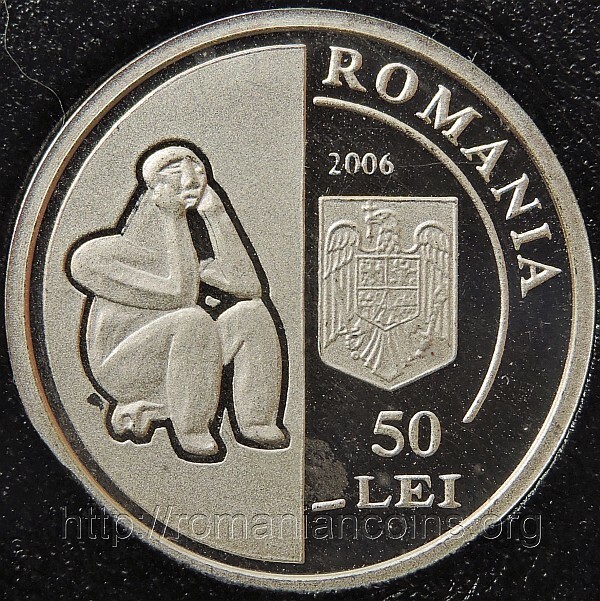 The set also comprises a 50 lei coin weighing 6.452 grams of 90% gold measuring 21 millimeter in diameter, characteristics identical to the ones of the 20 lei issued by Carol I. 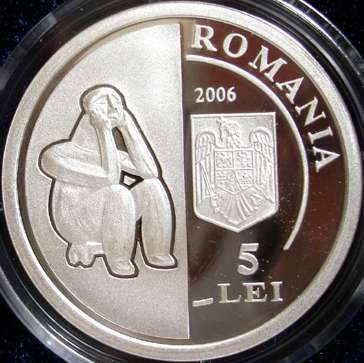 500 silver coins were struck. 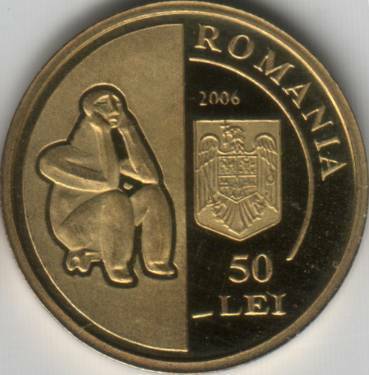 The tombac and the gold coins were minted in only 35 pieces each. 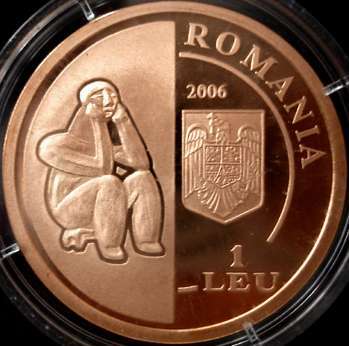 The coin pictures above are present on the site through the kind permission of Mr. Radu Lissner.